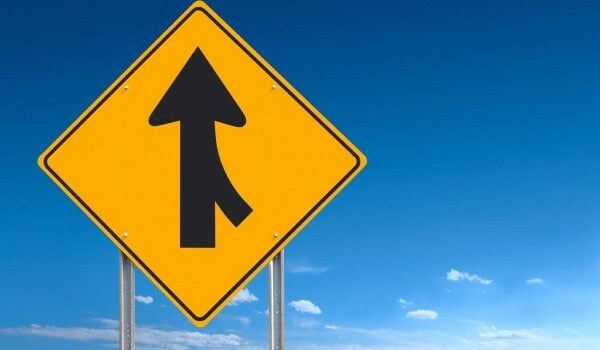 The boards of Canadian cannabis giants Aurora Cannabis Inc. and Medreleaf have agreed to a friendly merger worth $3.2 billion dollars. The deal is expected to fly through shareholder approval. The new company will be an instant contender for King Canopy’s crown. 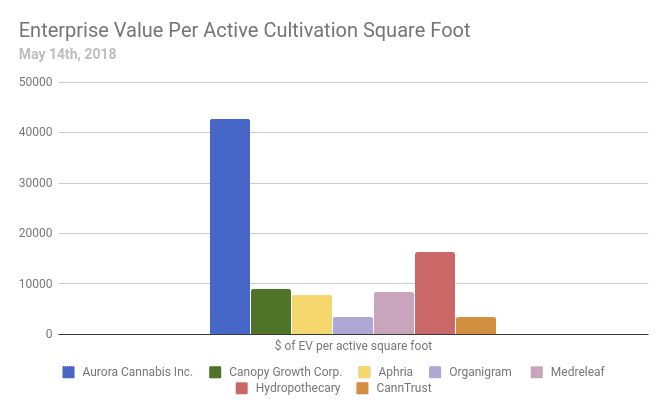 Last quarter, Canopy used an industry leading total of 685,000 active production square feet to produce 2,300 kg of product, twice as much as second place MedreLeaf. On a combined basis, Medreleaf and Aurora produced 2,425 kg out of 360,200 square feet… sort of. As we’re fond of telling everyone ad-nauseum: Aurora’s actual, saleable in-house production can not be verified. It was Medreleaf carrying the production load, and that may be why Aurora was so keen to buy them. 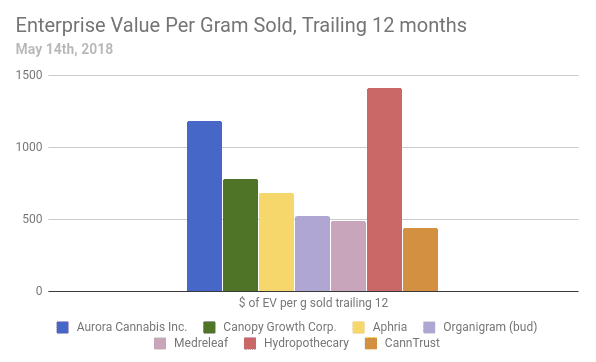 The respective valuations of these companies in this inflated market may be why Medreleaf was so keen to sell. Let’s break it down. More to the point: What doesn’t matter. In the Canadian pot sector, where most companies run at a loss, there’s no such thing as an earnings multiple. Cashflow multiples, currently working their way into the thousands, have lost all meaning. The pot sector is valued on production space. While the market and these companies like to talk about planned production space and “fully funded capacity,” we don’t buy it. Not all future production space is created equally. There’s no telling when it will be built or how well it will produce once it is built. Even Canopy had to take 20,000 square feet off line in Creemore to sort it out. There are just too many variables for us to give these companies credit for the production space of the future. b) how much product it’s producing. More unfinished space can always be bought or built but there is only so much known-to-be-effective space. Next: What is It Worth? Here’s what the market is giving them for rooms with the lights on. And here’s what the market is giving them for what they’re getting out of it. 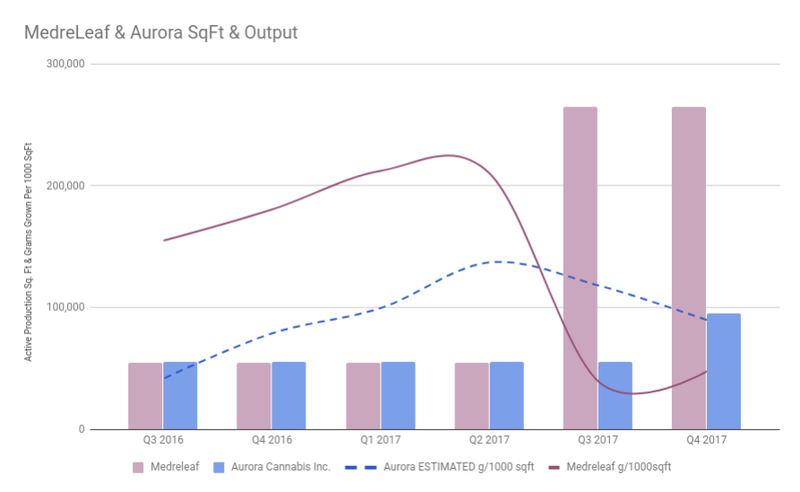 Unlike MedreLeaf, Aurora doesn’t grow all of the product it’s selling. 35% of the product ACB sold in Q3 and Q4 2017 were bought from outside producers. The outsourced total for quarters prior are unknown. On the chart below, we’ve projected that 35% backwards to all quarters. The Aurora line is dotted because of the backward projection. Even if we didn’t shave their sales for Q316 through Q217, they still wouldn’t beat LEAF’s. That LEAF grams per square foot line had been climbing steadily before they brought on the 210,000 square foot Bradford facility and blew up their denominator. Already, quarter to quarter, it started to creep higher. Because understanding the elements of the deal is the best way to understand this messy roller-coaster of a market. Aurora is making this deal because MedreLeaf has cultivation assets that are ready to go, and the opportunity to buy them for paper may not last forever. Medreleaf is making this deal because the best-in-class cultivation assets that they have built are likely getting as much value right now as they ever will. There is a shift coming to this market, and it isn’t clear to anyone where all the pieces are going to end up once it settles. There’s a good case to be made that the market will be over-supplied and, if that’s the case, Medreleaf isn’t going to be around to find out. Better to leave the value creation to Aurora: the undisputed champ of creating value in the stock market. 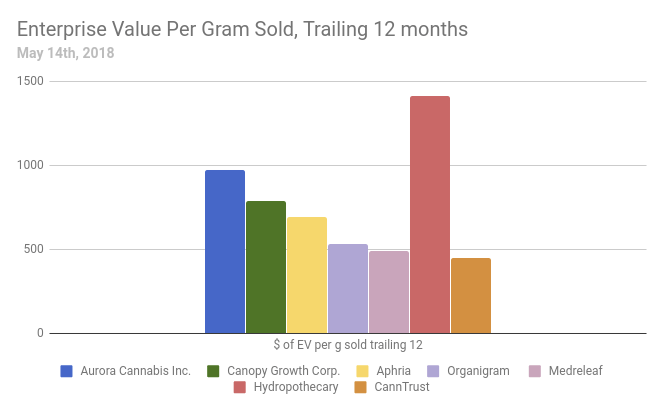 Here’s the EV/grams sold chart using our calculated total for the saleable grams that Aurora is known to have produced. Enterprise value is based on the current market prices (ACB.T: $7.92, LEAF.T: $25.38). The deal values Medreleaf at $29.44/share. This Version of the EG/Grams sold chart devides Aurora’s EV by the grams that we calculate they grew themselves. CORRECTION: A previous version of this post had the ACB.T and LEAF.T merger being worth $3.2 million, when it is of course a $3.2 billion deal. Fundamental Hype regrets the typo.